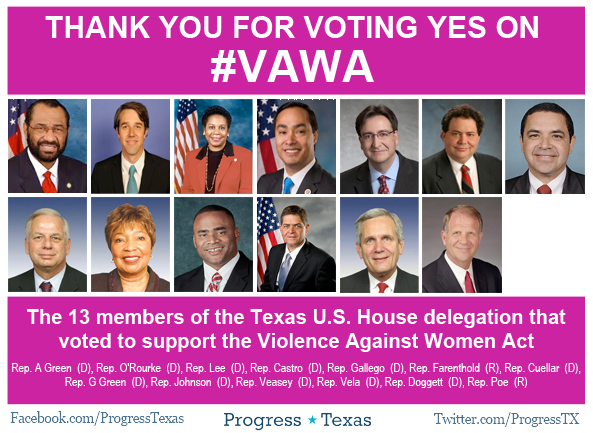 With a 286 to 138 vote, the Violence Against Women Act (VAWA) was passed in the US House of Representatives. The bill is now on its way to President Obama's desk. The VAWA includes provisions that would protect Native American women living on reservations, LGBTQIA, and undocumented women who are victims of domestic and intimate partner abuse. One more time, just so Ted Cruz can hear us! Both Texas Senators - Ted Cruz and John Cornyn - voted against the bill in the U.S. Senate.